Former player, coach and opinionator. One can go back to schoolboy rugby where you can still hear the coaches telling you that all matches matter. 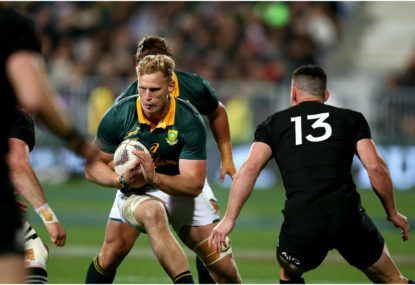 And so it was, September 15, 2018, in the land of the Long White Cloud, The Springboks walked off the pitch victorious over the All Blacks. Nine long winters have passed since the Springboks edged the All Blacks at Waikato Stadium, Hamilton. 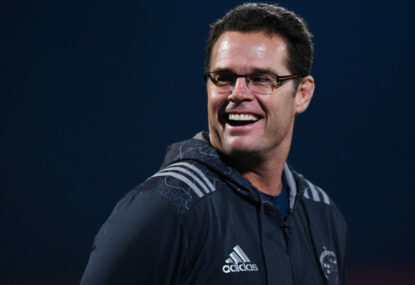 Rassie Erasmus, Springbok coach, crossed the Indian Ocean bound for Brisbane knowing he would have to shuffle his pack. 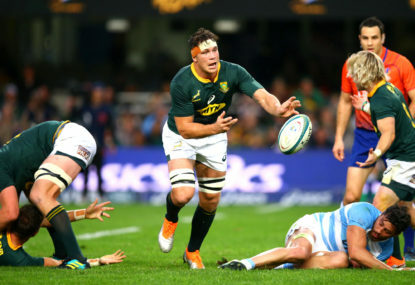 There’s a lot of blame to go around the South African Springbok side that ‘played’ against the Argentinan Pumas, but certain players are more notable than others. Francois Louw takes the ‘prize’ because he single-handedly missed two try-saving tackles. Are the 2018 Springboks new and improved? They say wise men learn from their own mistakes, but wiser men learn from other people’s mishaps. 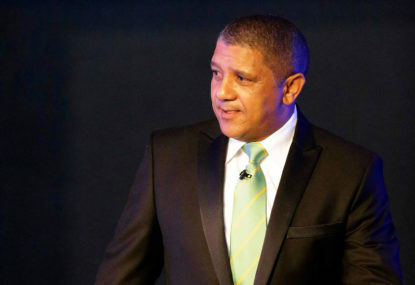 Five Test matches into his tenure as Springbok head coach and the verdict is now in: Allister Coetzee is a failed coach. Morne Steyn: When is enough enough? How is it possible Springbok coach Allister Coetzee could suit up Morne Steyn on the bench this week? Enjoyed the read Harry. For Rassie to be in a position to build a Bok squad on par with the ABs, SARU will need to be ‘reinvented’. SA rugby talent will continue to go north to earn their keep. Hansen has the luxury of building continuity; not so for this SA coach. Springbok report card: How does Rassie rank? …and may this not last nine long winters. Nice prose Harry; a test for the ages and great you were able to be a part of history to chronologize it for us all in technicolor. 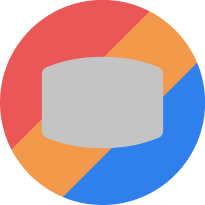 Corne – agree; it’s complicated, but your article and mine start a conversation. SARU needs to be privatized with owners of the Super Rugby Franchises given a seat on its board. With regards to the poor financial condition of many of the Super Rugby Franchises (not all), that’s my point: Financial opportunity is most rewarded when investors with vision can execute. Neither of us will document the exact blueprint for SA Rugby’s future, but we all agree it needs a makeover on a significant scale. To say that this is unattainable is to shut the door to any change. I hope that’s not the case. It’s time for SARU to privatize and negotiate with SANZAR about shopping both the Currie Cup and Super Rugby franchises to local investors, or overseas ones. Let investors with deep pockets negotiate their TV rights and infuse capital into building economical and viable winning sides. For example, the owners of the Stormers also have rights to Western Province. This will help stem the tide of players heading to Europe for foreign currency. It’s not perfect, but it’s a heck of a lot better than the current situation where SARU and the unions are run by corruptible idiots with no sense on how to market a winning product and pay their players. Limiting the number of professional players is simply a band-aid on severed femoral artery. Harry – if color is in question, the preference has to be Willemse at FH over Jantjies. It would take the act of one brilliant conjurer to re-write Jantjies’ test match stats. This is a player whose been given more second chances than Jacob Zuma could have ever wished for. My 2 cents worth here is on Willie le Roux. He was way out of position on England’s first try in the 1st test and not much better on defense in the 2nd. He’s really a shell of his old self, in terms of when he first came onto the Bok side. I think Rassie would do well to drop him and Allende and see what Robert du Preez can do at FB and Jan Serfontein at center. Well written and thought through. My only 2 cents worth to add to all this is that the decline of the Springbok side can really be traced back to 2009, the last time they won what was then the Tri-Nations. No imminent quota system hung over the team back then; rather it was a strange culture where the players, particularly the ‘veterans’ ruled the roost, vs. the coach. Years later the joke became a reality: In order for an up and coming Bok player to earn his colours, his targeted replacement would first have to be injured, retire or die. Not much has changed. Here’s what justifies ‘failure’ as a head coach: AC still started with Jantjies in Salta despite the fact Jantjies had, in the most clearest of ways, demonstrated his inability to play the FH position consistently at international level. AC then doubled down and put Steyn on the bench – a failed strategy. He also still went with Strauss despite the absolute evidence he has lost his way. Take this stat: Strauss has played both tests in this Championship series this year – so a full 160 minutes. Over the course of these matches he has carried the ball 8 times and made 6 meters – let me say that again: 6 METERS over 180 minutes. You could put Strauss on a beachfront promenade and only maybe then could he improve his distance. His counterpart on the ABs, Dan Coles, has played 147 minutes (mostly with bruised ribs) against a stronger opponent and carried 19 times, made 80 meters and scored a try. Should I also mention he beat 9 defenders and made 3 offloads while Strauss made zero in those categories? This is clearly a coach with no direction. Get a life man. Cosatu is the least of the Boks’ problems. HM’s record is the current #1 problem. The ABs have won 10 of the last 11 tests against the Boks since 2010. HM has won a single test in 7 outings against the ABs. Beating the All Blacks is, by every measure, is the benchmark of a top performing international team. Each year it’s the same verse; the same commentaries – like working to find the right letters on a diminished scrabble board. The Boks’ board has ‘letters’ such as Steyn, Matfield, Bakkies and Jannie du Plessis. The All Blacks board is playing with letters like Brodie Retallick, Ben Franks and Cruden. Dan Carter? They can afford to even discard that letter. The point is that the ABs have been bringing up tremendous young talent and slotting them into the side over time – they’ve been doing this for years. And the powers that be at SARU? They wait until guys like Matfield and Bakkies retire and then it’s a mad scramble and that’s a little too late. What went wrong for the Springboks in Salta?